Galway has a unique opportunity to be at the forefront of world cities, in leading not only in the fields of arts and culture but in the green transition to a low carbon future. Convergence 2016 opens with the launch of the new Post Carbon Galway initiative, a recently established cross-sectoral project set up to accelerate local pathways to a low carbon Galway, aiming to work collaboratively to promote climate action, sustainable living, environmental protection and sustainable development. We aim to unite local society behind an ambitious holistic vision that can only be achieved by a unity of purpose, in planning and creating a just, transition to a secure, flourishing, and authentically sustainable post-carbon Galway. Galway’s recent success in achieving the 2020 European Capital of Culture, as well as the prestigious European Green Leaf award for Sustainable City in 2017, and the European Region of Gastronomy in 2018, highlight the many new opportunities to work in partnership across all sectors of the City and County, in setting a new vision for a more equitable, healthy and sustainable future for the region. In the creation of a new sustainable era for Galway, the Post Carbon Galway collaboration acknowledges that transitioning to a more sustainable and community resilient culture and economy needs an all-inclusive partnership approach. This evening event aims to champion the potential and synergies in creating this umbrella for local initiatives in which we reduce our carbon footprint and introduce new ways to educate and inspire our communities. Join us to hear more about how we can collectively respond to Climate Change and re-imagine a more equitable and sustainable world. Galway 2020, Galway City Community Network, The Ryan Institute and Insight NUI Galway, Galway City Council, Galway County Council, Transition Galway, Post Carbon Galway, Cultivate, Galway Healthy Cities, Galway City Partnership, An Taisce, Green Sod Landtrust, Third Space Galway. Galway’s Convergence Festival ECOHUB aims to work collaboratively, with those committed to bringing about change, creating solutions to community and environmental challenges, through a week long series of events, films, workshops, exhibitions and thematic talks. This year’s week long pop-up ECOHUB, offers to host artists, activists, environmentalists, makers, musicians, foodies, healers and hackers, visitors and community members, as a forum for the cutting edge nexus of green ideas and conviviality, ecological health and wellbeing, showcasing local campaigns, offering great local food and introducing radical solutions for a future that works. Recognising that cities and towns need to continue to create space and new forums to learn from and inspire one another, to promote a vibrant and thriving culture, Galway’s Sustainable Living Festival makes the case for an Eco Centre for Galway. This project aims to further the development of the identified collective vision for a local sustainability research, education and demonstration project for Galway, incorporating community arts, sustainability education, exploring progressive transport solutions, community energy and new technology demonstration projects, recycling and zero waste projects, food sovereignty and local community supported agriculture, self sufficiency projects, community resilience, health and wellbeing. Galway’s Sustainable Living Festival will champion existing community responses, actions and collaborations, whilst continuing to forge new partnerships and the sharing of tools and practices. It will be an opportunity to educate and inspire citizens and visitors about green energy, sustainable healthy living, collective and cooperative action. This will be an exciting opportunity to bring together the key players and stakeholders locally, nationally and internationally involved in making carbon neutrality a reality and to showcase the many existing and potential groundbreaking initiatives from across the Region, that are learning how to live more sustainably and enjoy life without compromising future generations. Building on Galway’s potential to lead the way in transitioning to a more resilient, sustainable and equitable future, by becoming Ireland’s first Carbon neutral city, during this years Convergence Festival, we aim to kick-off the conversations that lead into Galway’s designation years as the first Irish City to host the European Green Leaf Sustainable City Award in 2017 and European Region of Gastronomy in 2018. This year’s main Convergence session in Galway provides an opportunity for policy makers, state agencies, civil society organisations, researchers, community practitioners and Galway citizens, to come together to maximise the potential for Galway to be a world city at the forefront of the cultural transformation towards sustainability and wellbeing. The event will maximise synergy between plans for the 2020 European Capital of Culture, the EU Green Leaf Award, the EU Region of Gastronomy, the WHO Healthy Cities initiative and the many other local academic and citizen engaged initiatives across the city and county. It aims to provide a forum for networking among the key local, national and international stakeholders, dissemination of latest research and an opportunity to showcase and discuss latest actions and policy developments. Galway has a unique opportunity to be at the forefront of world cities, in leading not only in the fields of arts and culture but in the green transition to a low carbon future. This conference will provide a forum to showcase and discuss latest actions from Galway, in leading the way to becoming Ireland’s first Sustainable City. This event is being co-hosted by Cultivate, Third Space and Collaborative Ways Forward and is supported by the Local Agenda 21 Environmental Partnership Fund, which is funded by Galway City Council and the Department of Communications, Climate Action and Environment. We wish to express our gratitude to all who participated in exploring Collaborative Ways Forward in recent months. We deeply appreciate you taking the time to share your stories of the work that you are doing in Galway and beyond and your commitment to Collaborative practices and a more sustainable, inclusive politics and culture. To follow up on the ‘Emerging Futures’ event, we offer here some brief reflections. During the inquiry into individual and collective needs we recognised the familiar calls for action to acquire some shared spaces in the city. This is an ongoing issue and one of the tougher challenges we all face. It is clear that there is a desire to take that particular conversation further and we encourage those of you with a passion to pursue this to get in touch. We also recognised that there is a wealth of knowledge and experience locally that holds great potential for shared learning. Many of the needs expressed on the day could be met through sharing of existing skills and know how. This in itself is fertile ground perhaps for the creation of some kind of skills and knowledge sharing network again if any of you are interested in taking this further get in touch. A number of follow up events and gatherings were also proposed. Participants suggested a ‘Pecha Kucha’ with short presentations as a way to learn about what people are doing. Others suggested a Community ‘Hackathon’ and ‘Innovation camp’ to share creative solutions to the challenges we face. Less formal gatherings such as a Potluck meal or even just a pub meet up could be easily organised. How about a get together over the upcoming holidays to share stories and achievements of 2015 and ambitions for 2016? Convergence the longest running Sustainable Living Festival in Ireland is coming to Galway this Friday October 30th. Recognising the need for an urgent and deep cultural shifts towards more equitable and sustainable ways of life. Across the country there is a growing interest in cooperative and social enterprise, renewable energy, co-housing, local food and the emerging collaborative economy. Join us for a day of inspiring stories, a participatory ideas workshop and a harvest dinner celebrating local food and culture. The days events welcome participation from everyone in Galway committed to creating a more sustainable future. We invite diverse perspectives and contributions from young people, students, grassroots activists, environmentalists, artists, cultural workers, SME’s, local institutions, government and community groups. Everyone is welcome and admission is free of charge. From 11am to 5pm – Emerging Futures’ is a participatory ideas workshop facilitated by Kevin Flanagan, Martina Finn and Davie Philip, where members of the public are invited to join in dialogue asking the question – ‘How can a cooperative and participatory approach support the transition to a more equitable and sustainable way of life?’. In the morning guest speakers will share insights and inspiration from successful local community and cultural projects such as Galway City Community Network, Community Workers Coop, GCCN, An Meitheal Rothar, One World Centre, G126. 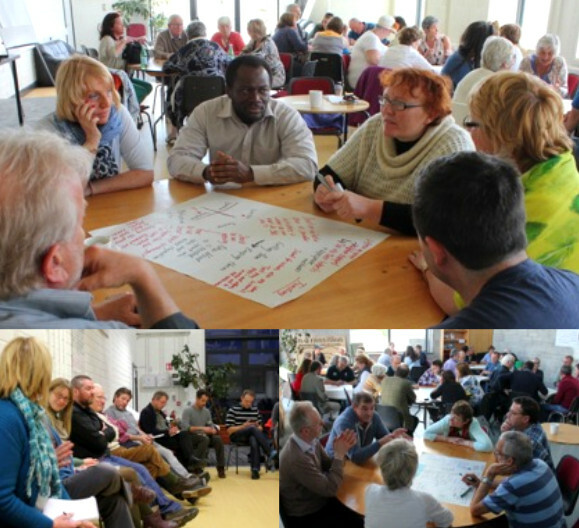 After lunch there will be dialogue and debate using ‘World Cafe’ to explore what actions we as a community can take. 11.20 – Check in – Appreciating who is in the room and what they do. 11.40 – Stories from collaborative projects. What can we learn? From 6pm – 9pm – The Halloween Harvest Feast is a convivial and family friendly gathering to celebrate Galway’s local food and culture, showcasing culinary produce from local farms and community gardens, cooked by some of Galway’s finest artisan establishments. The events are part of the nationwide Cooperative Convergence 2015 organised by Cultivate, and co-hosted in partnership with Collaborative Ways Forward, Transition Galway, Third Space, Galway City Community Network, Galway 2020, Galway City Partnership, Sheridans Cheesemongers.